Lease Offer. $3,807 due at signing includes $2,999 down, $0 security deposit, $645 acquisition fee and first month's payment of $163, excludes additional options, taxes, title and fees. Ford Fiesta offers two engines to suit your driving style: the responsive 1.6L Ti-VCT I-4 (standard in Fiesta S and SE) and the turbocharged, direct-injected 1.6L EcoBoost. All models also have an optional manual transmission. For those who prefer an automatic, Fiesta offers the PowerShift six-speed automatic with SelectShift. Available SYNC 3 offers the latest in voice-activated and touchscreen commands connecting you to people, music, and the available Navigation System with SiriusXM Traffic and Travel Link. Then there's premium sound, courtesy of the available Audio System from Sony with HD Radio Technology. Also available is Sirius XM Radio with over 150 channels, including commercial-free music, sports, talk and more. Introducing Ford+Alexa-bringing the amazing capabilities of Amazon Alexa from your home to the road. By using the Ford+Alexa app and connecting via SYNC 3 AppLink, you'll have access to Voice Navigation, Traffic Information, over 30,000 Skills, Amazon Prime shopping and you can even control your supported smart home devices. Stay connected, no matter where you are. 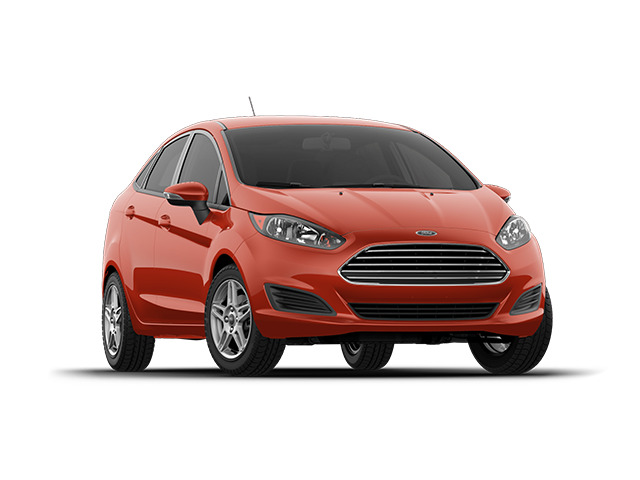 A lot of thought went into the design of the fun-to-drive Ford Fiesta, with features from the rear view camera and hill start assist technology (included as standard in every Fiesta) to the engineering that created the extensive occupant-safety structure. And with so many people driving the Ford Fiesta, MyKey lets owners set requirements or restrictions on certain features to help others to be more responsible. The Ford Fiesta offers a choice of two bodystyles — sedan and hatch — to match your lifestyle needs. The sedan has a trunk with 12.8 cu. ft. of capacity, and the 60/40 split rear seats can be folded to accommodate long items - like skis - through the trunk. Then comes the versatile hatch model with its wider hatch opening to handle larger cargo. It has 14.9 cu. ft. of rear space with the 60/40 split rear seat backs in the upright position, increasing to 25.4 cu. ft. when they're lowered. MSRP of $17,560. $3,807 due at signing includes $2,999 down, $0 security deposit, $645 acquisition fee and first month's payment of $163, excludes retailer fees, additional options, taxes, title and registration fees. Total monthly payments equal $5,868. Total payments equal $9,512. Actual rates and payments of closed-end lease may vary. Not everyone will qualify. You must take new retail delivery from dealer stock by 4/30/2019. Lessee responsible for insurance, maintenance, excess wear and excess mileage over 31,500 miles at $0.25 /mile. All amounts shown are estimates, retailer sets actual amounts. Includes all applicable offers. Residency restrictions apply. Lessee has option to purchase vehicle at lease end at price negotiated with retailer and approved lender at signing. Termination fee may apply. Contact dealer for availability and for complete details.